Similan Islands tours take you to Similan islands with striking features by speedboat. Similan islands tours from Khao Lak and Similan Islands day tour from Phuket are the most popular Similan islands snorkeling day trips to this Andaman jewels islands. At first sight this incredible islands will beat your imagination and your tour experience with the gifts of marvelous views and landscapes, dream crystal sea and sand beach you had most probably never seen before in your life. Similan islands National Park consists of nine extraordinary islands well known all around the world for it’s long white sandy beaches, crystal blue waters. 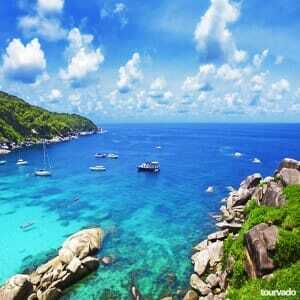 The entire National Park provide the absolute best scenery in Thailand and in the Andaman Sea. The Similan islands host such an immense variety of marine life, many species are even rare and endangered nowadays. 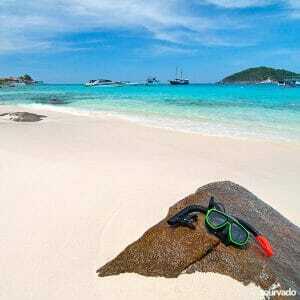 Discover the best tours in Similan Islands Thailand. The National Park offers many coral-sand beaches, they are all splendid with many interesting sights and view points. Similan island tours are speedboat tours day trips that starts from Khao Lak and Phuket to let you discover this amazing crystal clear waters and it's entire aquatic life of the Similan islands. Similan National Park hosts non the less many crab-eating monkeys and squirrels, bats and lizards, a variety of birds you can also observe, you will be bound to enjoy Similan island tour adventure to catch all your amazing moments in photographs. Imagine that some of the most spectacular coral in the Andaman sea grows here and can be found and observed snorkeling among the reef surrounding the islands as their shores turn the waters around into an adventurous playground for all water sports lovers and divers. Many sides of the islands currently have kept plenty of unique reef formations, very clean and tropical clear sand, snorkeling and swimming around this amazing colorful coral fishes and sea turtles will be your unique and sublime experience. All Similan island tours offer always snorkeling guides who will be there to take care of you, including of course professional staff and tour guide on board to let you have your time with great fun. Similan Island tour by speedboat will include for you all the features such as the land transportation from your hotels in Khao Lak or Phuket, an always yummy buffet Thai lunch, soft drinks coffee and tea, national park fees and your personal snorkeling gear and life jacket, Be sure to have a great camera with you because the pictures you will take will be absolutely memorable.